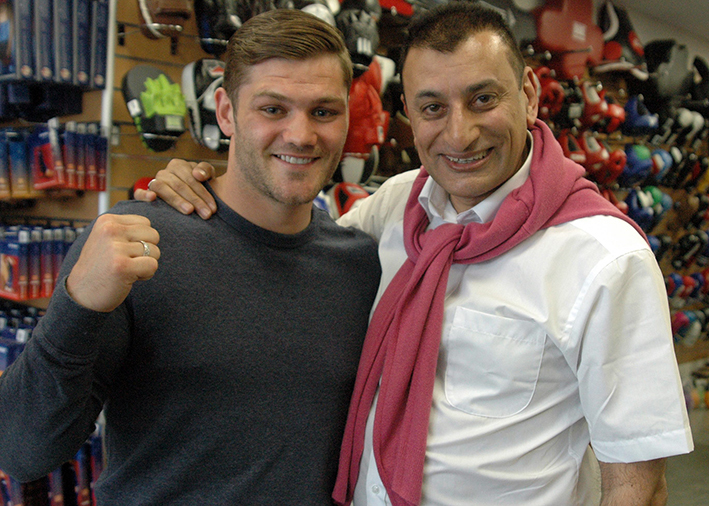 Just a few months after returning to the ring, following a four year sabbatical, George ‘Hit Hard’ Hillyard signs promotional deal with SSE Promotions head honcho Shyam Batra. Mr. Batra also announced that Hillyard will be making his first outing under the SSE Promotions banner on his upcoming CALL OF DUTY event at York Hall in Bethnal Green, London on Saturday 2nd August. Earlier today Mr. Batra spoke briefly of the first signing to his new promotional outfit. “I’ve known George for a while, in fact I personally sponsored him for his comeback fight on March 1st, so it seemed a natural progression, now I am promoting events myself, to have him signed with us. George is the real deal, I know he will go all the way to a World title, especially now I’m fully involved in guiding his career. We already have George on our 2nd August show at York Hall, where he’ll be fighting Ireland’s Tommy Tolan. It’s going to be a great event, we’ve already got Mark Prince on board, he’ll be headlining as he’ll be fighting for the MBC International title, George and Antonio Counihan will be the main support bouts and we have a some cracking undercard fights lined up too, it’s going to be a night to remember that’s for sure. After that it has to be a title shot on our next show, maybe an International or Inter-Continental title, we’ll have to wait and see what is available nearer the time. We’re already in discussions with two very good names for this, one from America and the other the UK. The American is a former IBF Champ and the British guy currently holds a World title, not a top flight Championship but with one of the minor players, that doesn’t matter as we wouldn’t be fighting for his current title anyway, we want something more meaningful for George. “What can I say, I can’t thank Shyam enough, he’s been great as a sponsor, thanks to him I was able to get back to training full time, you wouldn’t believe how much of a difference that makes to a fighter. Now he’s promoting me the sky’s the limit, as you now he’s already got a plan for my career. He’s talking about fighting for a title later this year, I’m not thinking too much about this, right now I am just focusing on the fight with Tommy Tolan on August 2nd, but knowing that Shyam has so much faith in me it don’t half make me feel good. I’m really looking forward to the fight and training has been really going well. We’ve had some good sparring over the past week, but now Shyam has arranged some top class sparring down at the TRAD TKO Gym for the next couple of weeks, I will be a hundred percent ready for Tommy on the 2nd. I’d like to thank Dave Murphy for everything he did for me, if it wasn’t for him helping me and having me fight on his show earlier this year I wouldn’t have got this opportunity now. I’d also like to thank all my fans for their fantastic support, without you, coming out to support me in force back in March, this would never have happened. George ‘Hit Hard’ Hillyard, versus Tommy Tolan, features on the Shyam Batra SSE Promoted CALL OF DUTY event at York Hall in Bethnal Green, London on Saturday 2nd August 2014. Tickets, priced £30 (standard) and £60 (Ringside) are available from the boxers taking part, on-line at www.tkoboxoffice.com or call the ticket lines on 07960 850645 or 07742 160228.